It's the Valentine's Day homestretch so we thought we'd showcase the very thing V-Day is all about--eating ice cream, watching 50 Shades of Grey and crying your single-self to sleep. *Le Sigh* But if you're not alone and miserable, you are probably calculating how much you will spend on the "right" gift, aren't you? Here's a tip: Valentine's Day isn't just about gift-giving or an expensive night out. What matters most on February 14 are simple gestures: love and appreciation. And because Valentine's Day is a consumer Hallmark holiday, what better way to show your love than a card? Whether you're trying to tell your crush how you really feel, or want something very special for your bae-- whatever your intentions are, the right words about love always are hard to find, but these e-cards will spark a romance that surpasses the chocolates you picked up at your neighborhood supermarket. 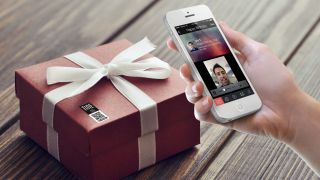 Apple quietly discontinued its iOS Card app that allowed users to customize, order and automatically mail out cards. The company is taking another shot at helping us manage all of the selfies and mini-moon vacation snaps scattered across many iDevices with its new iPhoto-replacing Photos app for OS X Yosemite this Spring. Until that happens, here are seven apps so for sending greeting cards all year round so you can print 'em, send 'em and share 'em to your heart's content.